Embraer Phenom 100 is a light, twin engine jet made by Brazilian aircraft producer Embraer, one of the largest aircraft manufacturers in the world. 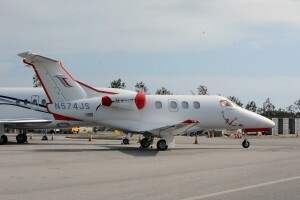 This small jet is primarily preferred by small companies and businessmen. Embraer delivered their first Phenom 100 aircraft in December 2008. As of 1st Jan, 2009 the cost of Embraer Phenom 100 was US$ 3.6 million. This aircraft is normally classified as a light private jet, but when it comes to space and performance, it goes head to head with larger private jets. 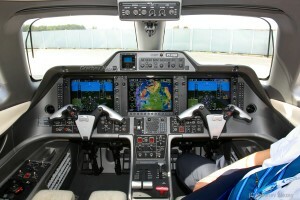 It has been certificated as Embraer EMB-500. For reliability and safety, Phenom 100 is designed with standard anti-skid brake-by-wire system. 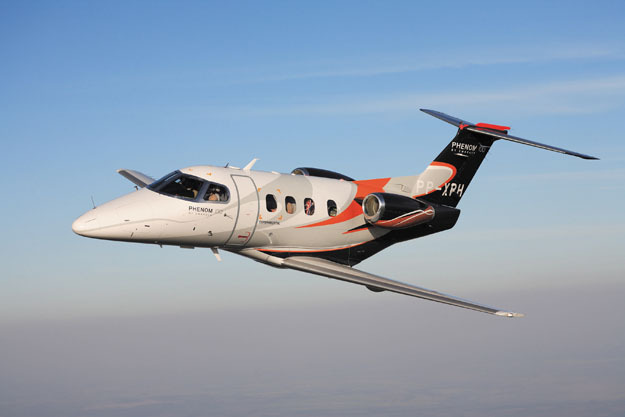 Embraer Phenom 100 is equipped with two Pratt & Whitney Canada PW617-F turbofan engines mounted at the rear. 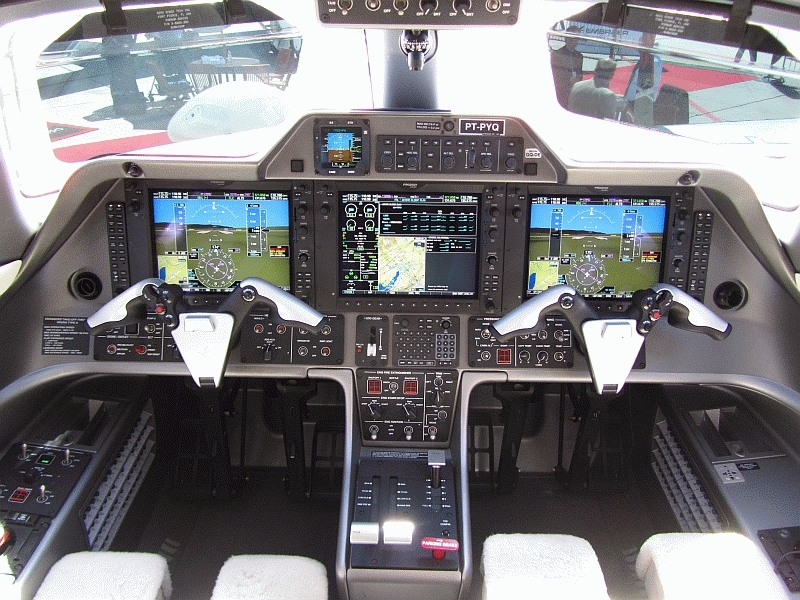 The engines are rated at a take-off thrust of 1695 pounds each, and they also have dual FADEC (Full Authority Digital Engine Control) making the flight very simple and efficient. An APR (Automatic Performance Reserve) system raises engine output to 1777 pound in the event of engine failure on take-off. Phenom 100’s engine interval is 3500 hours. 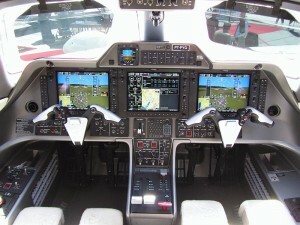 Phenom 100 features Embraer Prodigy all-glass avionics with three displays based on Garmin’s G1000. There are two PFD (Primary Flight Displays) and one MFD (Multi Function Display). All info is incorporated onto color HD screens. 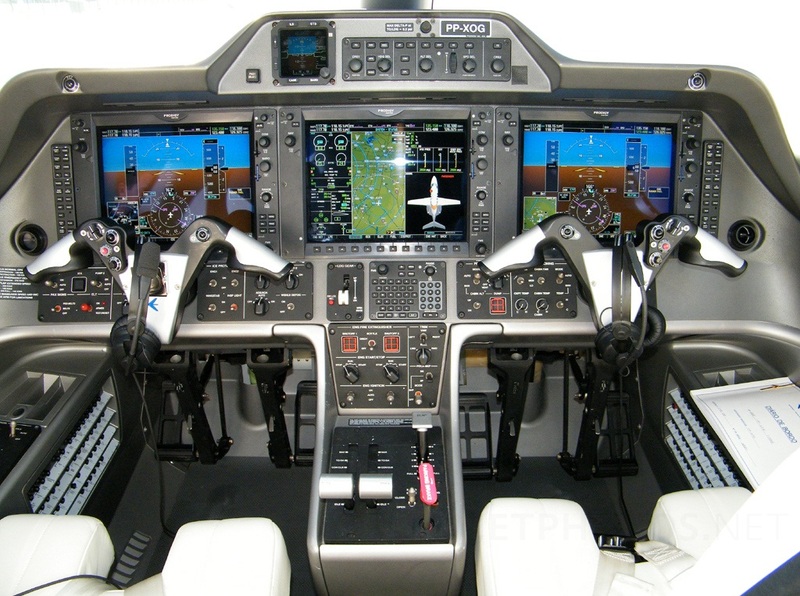 The avionics is designed keeping the pilot in mind. The flight-panning, situational awareness and aircraft monitoring tools are kept right at the fingertips. GFC 700, an advanced Automatic Flight Control System, is the Phenom 100’s dual channel, three-axis, fully digital autopilot system. The interior of the Embraer Phenom 100 is designed by BMW Group DesignworksUSA. The overall design is aesthetically pleasing and comfortable. The measurements stand at eleven feet ft long, 5’1’’ wide and 4’11’’ high. 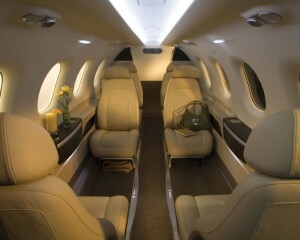 In its normal configuration, Phenom 100 can accommodate 4 passengers. 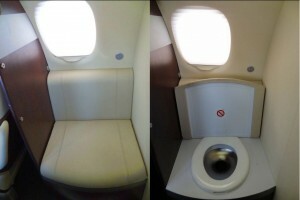 However, it can carry up to 6 passengers with 1 crew on-board. The aircraft boasts 305 cubic feet total cabin volume as well as 55 cubic feet baggage capacity. 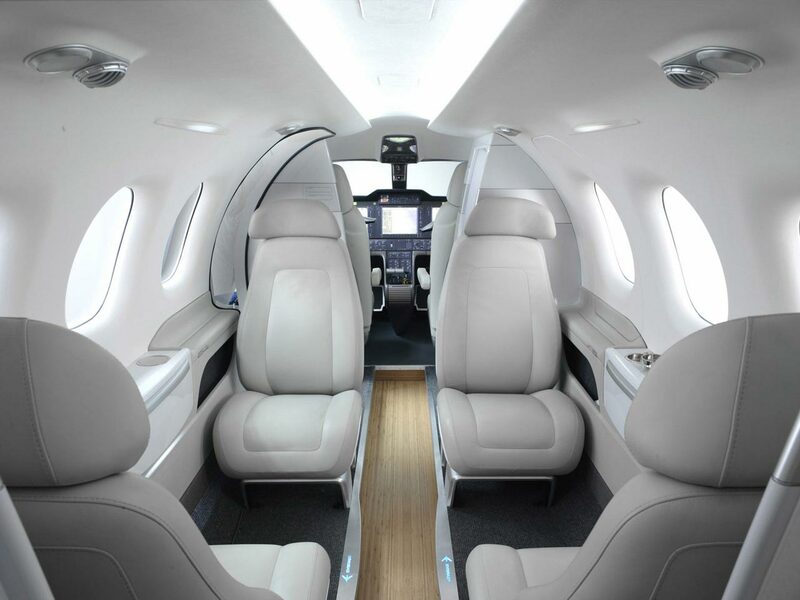 Phenom 100 features large comfortable leather seats that include arm rests and power outlets as well as several other controls right at your fingertips. 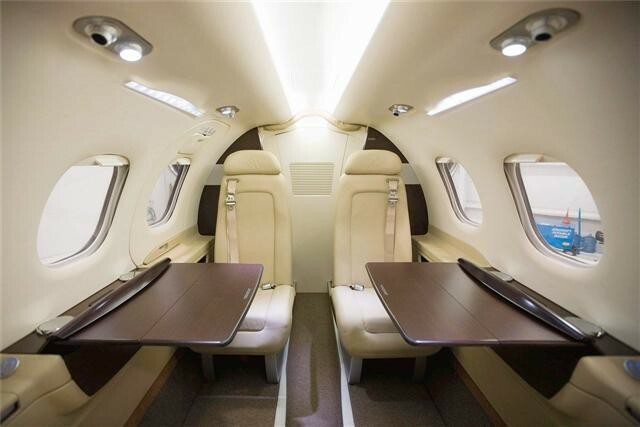 The interior of this private jet can be configured with seven pre-defined factory settings. Embraer Phenom 100 variant Embraer Phenom 300 is a light jet aircraft made by Embraer. It has been certificated as Embraer EMB-505. 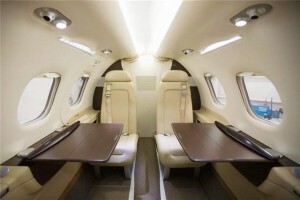 It has a flying range of 3650 km and in 2012, its price was US$ 5 million. 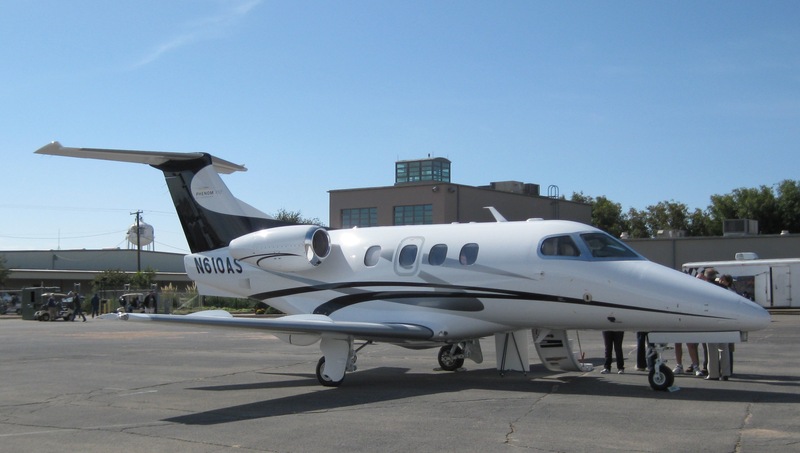 Phenom 100 is operated by several private companies, business personnel, aircraft management companies, charter operators as well as military operators. 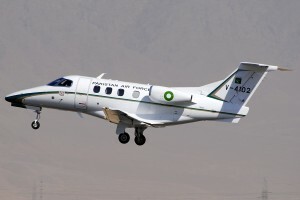 Pakistan Air Force uses 4 aircrafts for transporting VIPs. In late 2014, Royal Air Force and Royal Navy was declared as a preferred bidder for the Military Flying Training System program.